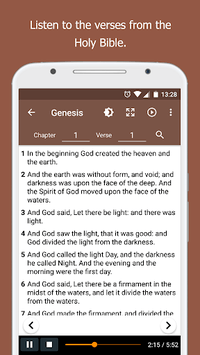 Read the Holy Bible from your Android phone. 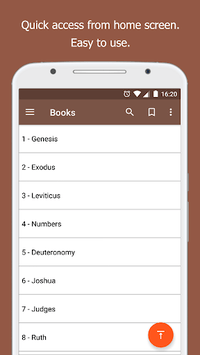 Download now the holy bible totally free. Holy Bible King James + Audio. 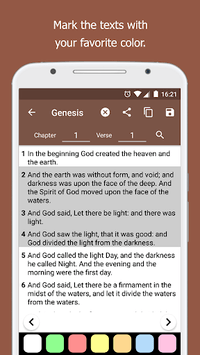 ➪ Verses Sharing on social networks, WhatsApp, Facebook, email, among others. ➪ Search by name or book number. ➪ Reading function in full screen. ➪ Function to allow the screen to be active during reading. ➪ Ability to change the font size, change the verse of the display size and the spacing between the verses. ➪ Possibility of evangelization, and can search the verses in the Bible or creating free text. ➪ With the word of the day, you receive a message every day at the time you want. ➪ Listen to the verses and meditate on the Word of God (requires internet). ➪ With gospel radio (requires internet). ➪ Available in 3 languages, Portuguese (João Ferreira de Almeida), English (King James) and Spanish (Reina Valera). ➪ Reading without internet connection, completely offline. ➪ Ability to share the APP with family and friends.